Jersey Shore Boca veteran Dan Corti (Lakewood), a junior at Nyack College was named to the Central Atlantic Collegiate Conference men’s soccer 2004 All-Conference first team as selected by the league coaches as announced today by the league. Corti was also a member of the Boca U23 team this past summer. NYACK, NY (November 5, 2004) – Jersey Shore Boca veteran Dan Corti (Lakewood), a junior at Nyack College was named to the Central Atlantic Collegiate Conference men’s soccer 2004 All-Conference first team as selected by the league coaches as announced today by the league. Corti, a skillful left sided defender, started all 20 for the NCAA Division II Warriors this season and tallied one assist while taking six shots. He helped Nyack to an overall record of 11-9-0 and a semi-final berth in the CACC 2004 Men’s Soccer Tournament before loosing a heartbreaker to Felician College 1-0. Corti was a member of the Boca U23 team this past summer which competed in the Mid-Atlantic Summer Showcase League (MSSL). 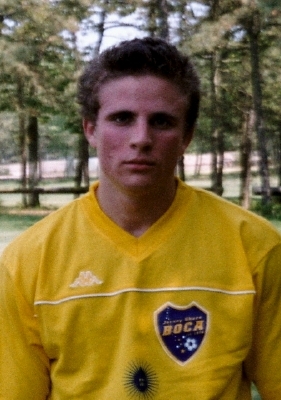 He is also former member of Boca’s Super Y-League and club teams. The Lakewood native is one of forty-three club standouts that previously played for Boca on either their Men’s, Super Y-League, Premiere Development League, Club or Youth teams, that are participating in NCAA intercollegiate soccer this fall for their respective institutions.